People often say that showering belongs to the list of the most enjoyable luxuries anyone can have. That sounds like a bold statement, but we just have to agree. There’s simply nothing better than starting your day with a refreshing shower and a cup of coffee. People often overlook the aesthetic value of shower walls by focusing on their functionality. We don’t say that that’s entirely wrong. We understand that there are people who don’t care about the looks of the product. However, shower walls can be both aesthetically pleasing and loaded with all sorts of different features. Whether you belong to the former or the latter group of people, our goal is to help you. Therefore, we’ve written a short guide that will help you determine which shower wall is the right one for you. Without further ado, let’s take a look at our buying guide for shower walls. What is a Shower Wall? Before we start getting into details, it might be a good idea to go over the basics. So, what exactly is a shower wall? Even though its name is self-explanatory, a shower wall can be more than just a simple panel. The initial idea behind a shower wall was to conceal the piping system and hold the shower head. However, they’ve changed so much over the last 20 years. Nowadays, their design changed drastically as various manufacturers started incorporating more and more features. The main focus is to make them as compact as possible while keeping their functionality at an optimal level. Newer shower walls (or should we say panels) are basically a complete showering package. They have additional taps for water flow control, horizontal and vertical shower sprayers, and so much more. Modern shower walls are also visually appealing due to the polished materials and the design. We’ll take a look at each of these aspects in the following sections. Here are some of the most important factors to consider when you go shopping for shower walls. The first and most important decision will be choosing between a one-piece and three or five-piece shower wall surround. As the name suggests, the one-piece shower surround is one, single acrylic structure with no seams or joints in between them. The big draw is that the fewer the number of joints, the lesser the chances of grout forming. It is one continuous pattern that looks seamless. However, these are not only overpriced but riddled with problems that are best avoided. For example, if there were to be a plumbing problem, you’d have to remove the entire structure. Also, these have thinner walls as compared to three-piece models. Not to mention that you will end up buying a lot of extra additional trim pieces to accommodate this into your shower area. A three or five-piece system, on the other hand, is cheaper, comes custom made to fit existing bathtub walls and prevents wall buckling due to natural contraction or expansion. True, there will be seams. But with a good quality sealant system, you should have no problems. So, despite what the sales guy wants you to believe, we highly recommend a three-piece or a five-piece shower surround. You need to measure up the shower area or the bathtub. Most tubs are 60” in length but the width varies. Select a tub surround that matches the tub size or is easily customizable to fit your tub size. Always remember, you do not need to replace the tub while installing a new surround wall. Just pick shower walls that match the tub. Shower wall surrounds come in a variety of materials from premium composite solid surfaces to cheaper alternatives like acrylic and plastic. Your choice will depend on your budget, the aesthetics that you are aiming for and the kind of performance and longevity that you expect from the wall surrounds. Premium composite solid wall surrounds are undoubtedly the best of them all. They are available in a stunning array of colors, patterns, and styles that can match tiles as well as textures. 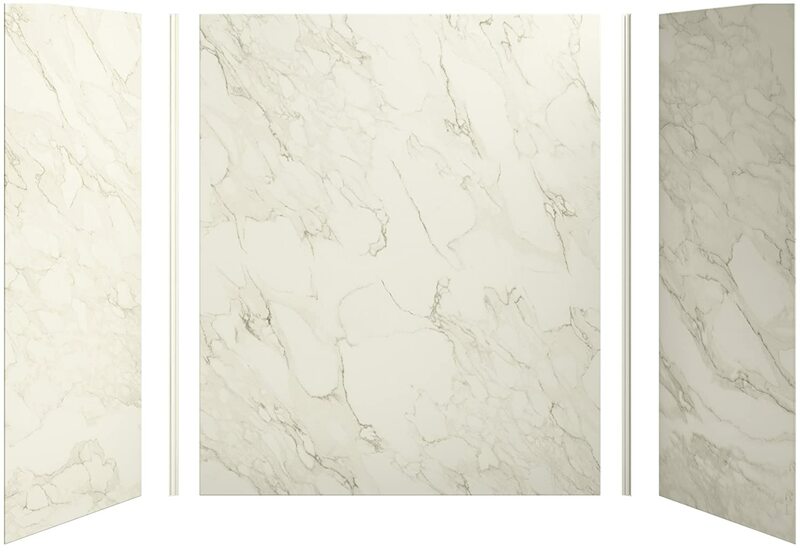 You can choose from walls to match granite or marble or natural stone, like quartz. Trim-kits are easily available which prevents the need to install tiles around the edges. These have an average lifespan of 30 years or even more. The cost ranges from $600 to $1300 and more. Fiberglass composites are cheaper than premium composites, but design options are limited. On a positive note, these are chip and scratch resistant. And installation is easier. The average cost is $300 to $700. If you are looking to redo the shower area on a shoestring budget, then acrylic wall surrounds are your best bet. Mind you, these are pretty flimsy and installed directly on to drywall. Some models have features like shelves and soap dishes. But the quality is nothing to write home about. At best, these will last in low use showers only. The ease or the difficulty of the installation will depend on the material you choose. Thicker surround walls can usually be attached directly to the studs. This is a slightly complex installation procedure that requires you to strip the drywall around the tub down to match the lips of the surround panels to the stud. Trims may be added later to cover the edges. Thinner materials like acrylic can be attached directly to the wallboard. Most solid wall surrounds do not require professional installation. Even if you have bare minimum expertise with DIY remodel tasks, you can install these yourself. Sometimes, there are structural constraints in the tub or shower area that might make a direct installation difficult. In such a scenario, plan in advance for any cuts or trimming that you might have to make. If you have chosen thicker materials, then you might want to look for specialized tools that allow you to cut through these with ease. While shower walls are available in hundreds of colors and designs, sometimes you just cannot find one that matches your bathtub or other fixtures. This can happen even with plain, solid colored wall surrounds. To cite an example, we spoke to a customer who bought a plain white composite shower wall. But their tub was whiter than the wall. It was a clear mismatch. In such situations, try and match the tub with some of the extra fixtures like molded shelves, shower seats or dishes. Otherwise, get the closest possible match. There you have it, folks. Our experience and reviews of the best shower walls. If it were us, then we would pay a little extra and get a surface like Kohler Choreograph that has an average lifespan of 30 years. Its available in all the designs and styles that you’d need and is repairable and customizable on site. But again, if you have budget constraints, the Swanstone shower wall is also a great choice.